Educated first at the Wyggeston School, Lilley gained a competitive Entrance Scholarship of 60 guineas to study medicine at the Charing Cross Hospital, London, and qualified in 1899, graduating M.B., B.S. in 1901. After graduating he was successively house-surgeon, house physician and R.M.O. there while taking his FRCS in 1903. In 1904 Lilley returned to Leicester to establish his own private medical practice, while at the same time heading the new Leicester and Leicestershire Maternity Hospital as Consulting Surgeon. He finally retired from both his private practice and the hospital position in 1940 when the Maternity Hospital merged with the Leicester Royal Infirmary. His early and continuing interest in the use of x-rays and in general surgery were put to use during his military service in World War I, when he was first surgeon to the Fifth Northern General Military Hospital, Leicester, and later as Radiologist to the Citadel Military Hospital, Cairo. 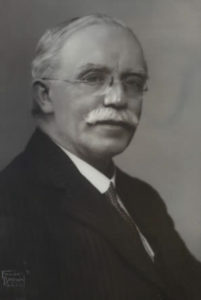 His other interests and professional service included work in the public health field, and he was for many years a Board Member of the Leicester Public Health Service (President in 1938), and also served as a consulting medical officer and referee in relation to National Health Insurance, the Workmen’s Compensation Act, the School Health Service and as Chairman of the Recruitment Medical Board during World War II. A noted musician, he was the Organist of the Unitarian Great Meeting, Leicester, for more than forty years, President of both the Leicester Philharmonic and Leicester Chamber Music Societies, and over the years he played many of the finest English cathedral and parish church organs. He joined the Lit. and Phil. in 1912, and supported many other national and local organisations including the Leicester Medical Society (President 1928-29), the British Medical Association (Council Member from 1931 to 1943), and particularly the Leicester University College, where he was for many years a member of Council, and was particularly concerned with promoting and helping to finance the establishment of a Department of Music and a music library. E. Lewis Lilley MB. FRCS. [Obituary] British Medical Journal 11th December 1948, p. 1040-1041. Presidential Address: [No title, but on “the evolution of the art of writing, past, present and future”]. Transactions LLPS Vol. 33 (1932), pp. 5 – 16.